August | 2015 | Live Cheap, Feel Rich! What’s that food that you just….don’t like? Mine, for YEARS, was olives. I so badly wanted to like them, and wasn’t sure why I didn’t. I love other briney foods like pickles, and, as someone who tries to limit their meat intake, so many salads and veggie laden meals are filled with olives. I’m so far from a picky eater and felt, honestly, annoying, to have to ask for special orders WITHOUT olives. I used to firmly believe in the ‘Olive Theory’ from How I Met Your Mother – no joke. The olive theory came about because Marshall, a husband in the show, hates lives, but his wife, Lily, loves them – in essence, they thought this made them a great couple – a perfect balance. Opposites attract, some may say. This was definitely the case with my husband and I – he loves olives. Over the years, I realized that not being able to share something he loves is less fun than having ‘the perfect balance’ and I set out on a mission to like olives. As two college psycology majors, we made it happen. SummerTomato.com explains the thought process of overcoming an aversion REALLY WELL. STEP 1: Knowing that you have a problem. Just kidding! The first step is deciding that there is value in enjoying a food you currently do not enjoy. Foods are worth discovering for taste and culture! STEP 2: Dedicate yourself to keep trying the rejected food until you find it prepared in a way that you like. I PROMISE that there will be a way you like this, even if it is deep-fried and covered in a sauce. You’ll find one. Each time you try a new way, your taste will become more acclimated to the flavor and the aversion will dissipate. That’s it. Keep trying! My husband swears that if you try something 22 times, then you’ll like it. Whatever the magical number is, I hit it. I can’t get enough olives now and I love every single variety in every form. One of my favorite forms is just the plain black olives, straight from the can. Does that make me crazy? I hope not. Join me in this obsession by getting 4 FREE Lindsay Olive Products (up to $2.49 each). Unfortunately, this only works in certain states, but you are sure in luck if you live in one of them! Print your coupons here now! Enjoy! Hey everyone! Happy Monday – and a very happy Monday it is since it is #NationalTrailMixDay! I am a HUGE fan of trail mix for so many reasons. Firstly, it’s nostalgic. I remember my sleepaway camp days when every afternoon I’d get trail mix from the store. They made it special, M&M’s clearly the highlight (they tried to keep candy to a minimum), and the most fun part was that they would serve it in an ice cream cone! It’s all about the presentation, even when you’re young. Secondly, I get really bored of eating things. Some people can mindlessly eat a bag of chips until they’re gone, but a few bites in, I’m bored. Call me lucky, but this just means I move onto the next snack in the cabinet. I only wish this worked as a dieting technique! Third and last – I love the variety that comes with trail mix – not only the ingredients within, but the fact that it can be sweet, it can be salty, it can be spicy, it can be all 3 – love it! It’s an easy, generally healthy, snack that you can tweak to almost ANY taste. This stuff is pretty awesome, and CLASSIC. If you’re looking to get your feet wet in the world of trail mix, this is certainly where you should start. Firstly, and this goes for all recipes, go to your local bulk store for ingredients. This is going to be MUCH more cost efficient than pre-packaged ingredients. Now, down to business. This is crazy easy – 2 cups California raisins, 1 cup lightly salted sunflower seeds, 1 cup whole natural almonds, 1 cup dry roasted peanuts, 1 cup roasted and salted pistachios, 1 cup dark chocolate M&Ms. Yep, just mix them all up…you’ve got your trail mix. Store in an airtight container and enjoy! I am eternally a supporter of savory>sweet, so I absolutely love this recipe. 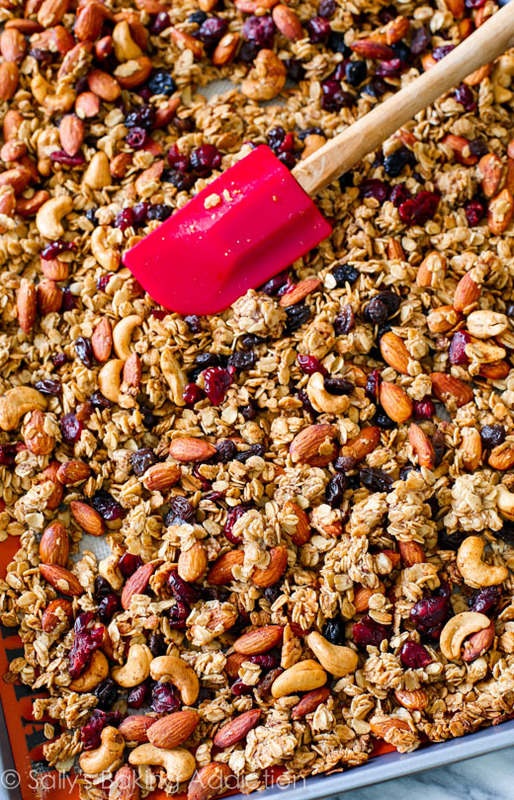 This recipe requires a little bit more work than your average trail mix – even…gasp…an oven. Don’t worry – crazy simple! Ingredients include rice cereal (Crispix? Chex? Your call! 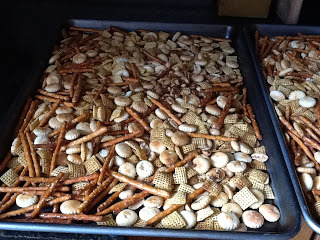 ), pretzels (this recipe recommends the sticks), oyster crackers, roasted unsalted peanuts, melted butter, Worchestershire sauce, Old Bay seasoning, lemon juice, and hot sauce of your choice. Combine all dry ingredients, and drizzle the spices and liquid combo over top. Bake an hour at 250, stirring every 15 minutes – allow to cool & voila! Delicious. The beauty of trail mix is that it can really be anything you make it. In my head, trail mix is any combination of ingredients that can be transferred easily and happily from hand to mouth. Granola – sure! I love this recipe – its crunchy with a fun texture – and I feel just…really healthy eating it. Perfect as is or top your yogurt with it! Ingredients include old-fashioned rolled oats, whole unsalted almonds, whole salted cashews, cinnamon, maple syrup, coconut oil, almond butter, an egg white, vanilla extract, dried cranberries or raisins, and semi-sweet chocolate chips. This is another oven recipe – preheat to 300, toss almonds, cashews, and cinnamon in a large bowl. Microwave the syrup, coconut oil, and almond butter for about 30 seconds, allow to cool, and toss in the egg white and vanilla – pour over oats to coat and ensure that all are moistened. Spread onto baking sheet and bake for 45 minutes. Allow to cool completely and toss in the dried cranberries, raisins, and chocolate chips – yum! 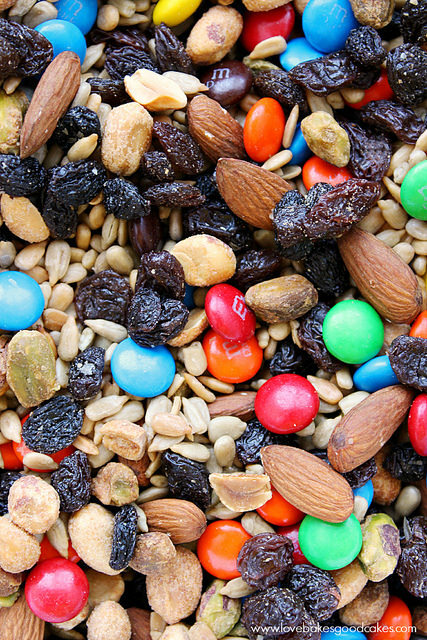 So there you have it – 3 amazing trail mix recipes. Don’t forget – if you don’t like a certain ingredient, if you want to try something new in terms of a spice – have at it, go crazy! Trail mix is the perfect snack to experiment with. Enjoy! Get a FREE Box from Try The World! Try The World is an awesome new company that a friend recommended to me this morning. Every 2 months, you receive a box from a new country with 6-7 gourmet products curated by expert chefs. For example, this month’s box is Japan and includes 6-7 artisanal delicacies curated by a local expert, a card describing each full size gourmet product, and a culture guide with music, movies, recipes and more. My friend described this as ‘the perfect date night’ – so fun to try new things that you’d have to go to another country to experience otherwise! These boxes are FREE shipping, FREE returns, AND you can cancel anytime – there are really no strings attached here. If you don’t like it, its easy to simply bow out. Bi-monthly, this costs $39/box – but you can also pay semi-annually at $35/box (saving 10%) and annually for $33/box (saving 15%). The best part though? Your first box is FREE. After that, you can email up to 5 of your friends and also give them a free box! Why not try it out? Sounds like fun for the whole family. In my mind, there’s two types of people: people who love tuna, and people who detest tuna. There is simply no in between. Luckily, I’m a lover. I think tuna is not only delicious, but a really easy way to get more lean protein into your everyday diet at a low cost. Lucky for us, things are about to get even lower. Consumerist.com gives us some background on the TUNA LAWSUIT. Two and a half years ago, a man who eats tuna filed a class action lawsuit against Starkist tuna. His allegation? The company is deliberately under-filling each can by a few tenths of an ounce. How this man even knew this is beyond my imagination, but Starkist has settled the case (without admitting fault). If you’re a resident of the United States and bought at least one five-ounce can of any of these tunas from Starkist between February 19,1009 and October 31, 2014, you’re eligible to file a claim – and no, you don’t even need a receipt. It’s basically an honor code – you’re committing perjury if you file a claim and haven’t purchased Starkist tuna during that time period. To file your claim, go to this hilariously accurate and blunt url: http://www.tunalawsuit.com and file your claim by November 20, 2015 – you can get $25, or a voucher for $50 worth of tuna. I know I have definitely purchased Starkist tuna in the past 2.5 years – I’ll be collecting! I know how much you all love free cosmetic and makeup samples, and I’ve found a great one for you this morning. Los Angeles based Frankie Rose Cosmetics is a unique brand of high quality makeup and tools designed to create a variety of crave worthy looks for women of all ages. They focus on ‘the perfect look’ and really want to match not only your skin tones and complementary colors, but your style. Frankie Rose has created a Foundation Sample Program to make sure that you can determine the proper color of foundation prior to purchasing a full sized bottle – I wish more makeup companies did this! It’s so important to match or you look like a ghastly version of yourself. Cost: Foundation samples AND cost of shipping are free. Selecting a color: Not only does Frankie Rose provide some photo examples of Frankie Fans and celebrities wearing their foundation to help gauge which shade is right for you, but they also provide color swatches (click here to see). Simply click on a shade swatch and click alternate image views. Quantity: Limited to 1 set of samples per person – but don’t worry – one set contains 3 shades, so there’s plenty of room for you to experiment! Shipping Time: For US residents, west coast ~3-5 days, east coast ~4-7 days. Canadian? About 7 days. So click here and see if Frankie Rose foundation is right for you! What a great deal.